Cadillac cars drive across a vast expanse of white, a featureless void with no point of reference except distant mountains in the background. A caravan of motor homes winds its way toward a safe place in the movie Independence Day. Models pose on a snowy plain under an impossibly blue sky. Telephone companies demonstrate what it must be like to be on another world. What do all these things have in common? They were all photographed and choreographed at the same site, the world’s most other-worldly place, the Bonneville Salt Flats of western Utah. Car fanciers are likely to recognize the place. After all, it’s the place where, from 1935 to 1970, numerous drivers set the Land Speed Record (LSR) – the fastest speed in an automobile. It’s the place where various drivers have set innumerable endurance records – 10 miles, 200 miles, 24 hours, and 48 hours. It’s also the place where, three times a year, racers gather to compete for speed records in a variety of classes. Because people who know cars recognize the salt flats, companies that have anything to do with cars – auto makers, the tire manufacturers, oil businesses, service stations, parts builders and suppliers – all use the salt to demonstrate their products. Those who deal in aftermarket auto parts know that speed sells, and Bonneville is the very essence of speed. But what about those who have never followed automobile racing and have no idea what the LSR is? The Bonneville Salt Flats is still a place to advertise automobiles and their parts. Why? The flats are a wide open space with no traffic and nothing to get in the way. A car can drive down a safe surface in a place where the focus is just on the car. There is nothing else in the way except for a distant mountain. For a still photograph, nothing takes away from the beauty of the car (or the tire). Well, maybe not anything else. There are the magnificent sunrises and sunsets that put the object in the best possible light. The Bonneville Salt Flats is the perfect backdrop for artistic endeavors. From still shots to video, the salt flats is seen by an international audience as the setting for commercials, movies, music videos, and printed materials such as advertisements and calendars. The flat white plain of the salt flats appears to be snow, broken glass, or the surface of the moon. The possibilities are limited only by the imagination. What Are the Bonneville Salt Flats? First, some background information on the flats. The Bonneville Salt Flats – an area along the Nevada/Utah border, about 100 miles west of Salt Lake City – is one of the largest flat, desolate, empty, barren, eerily beautiful places on earth. The area is so wide open that it’s one place where viewers can see that the earth curves. The 30,000 acres of salt stretch for miles of snowy white brilliance. The salt is so hard that it’s almost impossible to drive a stake in it. During most of the year, it’s completely dry, yet one small rainstorm can turn it into a shallow lake that remains for days because the water cannot be absorbed quickly into the solid salt. In the summer, distant mountains seem to float on a shimmer of heat haze. Nothing lives on it – there are no insects, no plants. Not even the hardiest lizard or desert thorn can find a living there. During the latest Ice Age, a freshwater lake – now referred to as Lake Bonneville – once covered western Utah. Glacial melt fed the lake which then drained into the Snake River. As the earth warmed and the glaciers disappeared, the lake dropped below its outlet. The highly concentrated minerals created the Great Salt Lake, one of the saltiest bodies of water in the world, and a large flat salt bed further west. The large salt bed is now known as the Bonneville Salt Flats. What Are the Bonneville Salt Flats Used for? Despite the emptiness of the place, miners and racers found a use for the salt flats. The miners came first. Shortly after a railroad completed a track across the vast plain, entrepreneurs wondered what they could do with all that salt. Straight mining of salt wasn’t profitable, but enterprising men discovered that the potassium chloride could be used to make potash, an essential fertilizer for growing plants. The need was especially great during World War I when the world lost the use of the German markets – then the largest suppliers of potash. But even after the war ended, companies continued and still do find a market for the specialized salt. In fact, they have expanded the market by also harvesting magnesium chloride, which is used on roads to control ice in the winter and dust in the summer. The other major use of the salt flats is automobile racing – actually cars racing the clock. From the first time that motorized vehicles traveled on the salt flats, it was obvious that this was an ideal venue for racers. At first, no one took the salt flats seriously. But then three British drivers – John Cobb, Sir Malcolm Campbell, and G. E. T. Eyston – drove on the salt. In 1935, Campbell went over 300 mph for the first time; during the remainer of the decade, Cobb and Eyston increased the LSR. They also competed with Utahn Ab Jenkins for endurance records. During the 1960s, Americans drove jet cars faster and faster. Even when Richard Noble returned the LSR to England in 1997, he initially wanted to set the record at the salt flats because of its reputation in Great Britain. Unfortunately, the track was too short, and he went to Black Rock in Nevada. Once drivers started setting records, the salt flats provided another use – advertising the cars and the products that were driving very fast. At first, the cars focused on the racers – their cars and parts. But as the Bonneville Salt Flats became known as the place to drive fast, the companies no longer referred to the records. They used the venue as a good place to show off cars. They expected those who knew racing would also recognize the flats. It takes a special car, special tires, and special equipment to set speed records. At the same time though, the technology to create fast cars can make everyday cars safer. There is an old adage among auto racers, taken from the horse-racing fraternity: Racing improves the breed. In this case, it means that equipment used to make cars go faster, stop quicker, corner better, and survive crashes will eventually end up on production cars. Disk brakes, for instance, were a race car refinement that made their way into performance cars, then into sedans. Now, every car has disk brakes at least on the front wheels. But speed was not Pierce-Arrow and Jenkins’ main goal. The company claimed that their engineering was moving toward “ultimate perfection.” And Jenkins explained, “I don’t want to drive an automobile 125 miles an hour or even 100 miles an hour, and I doubt you do either. But I do want to own a motor car that is built so perfectly, and engineered so smoothly, that normal speeds are child’s play for it.” The Bonneville Salt Flats provided a place to test the cars – and show them off at the same time. 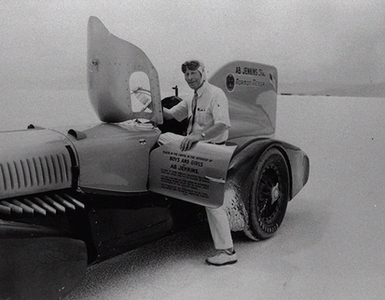 Jenkins went on to set other endurance records on the salt flats, but not in a Pierce-Arrow. He is best known for his Mormon Meteors, super-charged Dusenbergs designed, according to Jenkins, with “my good friend, Augie Dusenberg.” The company wanted to work with Jenkins to test their products but also to support a friend and be a part of a community. The Successful Race Car Driver explains that good sponsors are “closet racers.” Dusenberg matched exactly what the modern book suggests every driver needs: someone high up in the company with an excitement for driving fast. Jenkins drove other cars as well. He drove a Pontiac, and as a result, Pontiac named one of its cars Bonneville. According to a 2001 press release, "The Bonneville is the only American production car to earn, not be given, its racing name." In 1956, 73-year-old Jenkins and his son Marvin drove a Pontiac and broke the 24-hour endurance records for a Class C stock car at 118.375 mph. In 2000, Pontiac "transformed the Bonneville SSEi from a family sedan into a Salt Flats record seeker." While the company hoped to go 210 mph, it only got to 195.048 mph, still setting a record. According to the press release, "Due to a limited preparation time, and first race Gremlins, the Bonneville was not able to obtain its 210 mph goal.” The next year Mike Cook, a member of the 200 mph club, exceeded the 200 mph level, going 202.524 mph. MG, according to the company, “the sports car Americans loved first,” also used the salt flats to set records and advertise their cars. MG has a long history of participating in speed events and using them to promote their sporting image. After World War II, MG sent several cars to the salt flats for records. Lieutenant Colonel A. T. “Goldie” Gardner was the first with his MG EX 135 (EX stands for experimental). In the 1950s, George Eyston worked with MG to promote the MG-A. The company built EX 179 and 181. MG hired famous race car drivers from the United States and Great Britain to drive the EX 179 at Bonneville, as much for their fame as their driving ability. These included Ken Miles, an American driver. According to a MG history, "Miles was one of the most capable drivers to ever take the wheel of an MG. His performance in specials as well as production cars is legendary." MG built the EX 181 exclusive for another supporter, Stirling Moss. In the racing world, Moss is known as one of the best, if not the best driver, in Formula One racing. Moss never won the Formula One Driver’s Championship because he insisted on only driving British cars and other companies produced faster automobiles. Phil Hill, an American Formula One winner, also drove the car. Both Moss and Hill set records for their engine class. For years, MG did not try to change that record, arguing that no other automobile companies were going for the records and MG was just competing against itself. That changed in the 1990s though. Rover, now the owner of MG, sent “Project EXF,” a specially designed MG-F to break Moss’s record at the salt flats. Although the car did not set a record, Rover was impressed (MG, “The 217 mph MGF”). The company then asked Andy Green, an airplane pilot who drove Richard Noble’s Thrust SSC faster than the speed of sound, to drive MG EX255, named because the company hoped it would break Hill’s 254.91 mph record. The car came to Bonneville in 1998, but because of mechanical problems, it did not set a new record. The attempt shows that MG’s new owner sees the magic of the salt in promoting cars – even a car that can no longer be sold in the United States. To underscore their connection with Bonneville, Rover, now called MG Rover, brought another MG to the salt flats in 2003. This time, they brought a station wagon. There, they went more than 225 mph and have applied to the Guinness Book of World Records as the fastest station wagon in the world. In an advertisement for Renault of France in June 1957, the headline read, “Turbine engine for your car?” Underneath was a picture of Renault’s experimental car, “Shooting Star” which had gone 191.2 mph, 40 mph faster than any other turbine-powered car. The ad explained, “The Shooting Star is just one phase of the Renault research program that also produced the most up-to-date cars on the road today.” The remainder of the ad was for the 1957 Daupine with a “Ventoux” internal combustion rear engine. Although the ad did not mention the salt flats, the drawing showed Floating Mountain and the familiar Bonneville Salt Flats scenery. But not all car companies were interested in records. Some just wanted their cars to look good on the salt. It is difficult to find out why the advertisement agencies use the salt. The automobile companies hire the agencies that make the decisions based on what the company requests. We asked both car companies and advertisers why they chose the flats; none responded. But companies like Cadillac have posters with their cars on the salt. For car lovers, the backdrop represents speed, racing, and excitement. And, of course, it’s a dynamite photographic backdrop. All these advertisements referred to records and still photography. In the 1950s, television brought a new dimension to use of the salt flats – movement. A study of post-World War II television argued that companies wanted to convince Americans that they needed the newest gadgets; they were essential for the American Dream. One way to convince people that they needed cars was to show them in motion. Bonneville was the perfect place to watch a car move. First, it was a place where other cars had driven fast. Then, it was a place where the car could go fast. In addition, the wide open space was a perfect place to show off the car's beauty. And finally, most men and many women thrilled at the possibility of speed even if they could only watch. A 2003 television commercial showed a GM car on the salt flats and bragged of speed. But cars are made of parts that wear out and need to be replaced. So automobile accessories also used the salt for advertisement. The British drivers – Campbell, Cobb, and Eyston – had sponsors who used their records to promote their products. All three used Dunlop tires, and the company created a poster with pictures of the drivers and their tires. Campbell and Eyston worked with Castrol Oil. In fact, Castrol Oil was a long time sponsor of land speed racing. Campbell and Sir Henry Seagrave exchanged the record at Daytona Beach. Both used Castrol, and the company made posters with pictures of the cars and the speeds. Eyston used Castrol Oil and then worked for the company after World War II. Craig Breedlove, who set the LSR in the 1960s, depended on sponsors to build his cars. He started as a drag racer, building his cars in his backyard and then later in a shop. But he needed more help, especially with tires. Only Goodyear and Firestone had any experience with tires that would go as fast as Breedlove hoped to drive. Since Firestone sponsored a competitor, Nathan Ostich’s jet car, Breedlove decided to go to Goodyear. That company worked with Mickey Thompson, but since Thompson’s was not a jet car, Breedlove did not see a conflict. At first, Goodyear agreed to give tires, but refused to give additional support. Then the company backed out of even giving tires, explaining it wanted to cut back on racing. But after Shell Oil agreed to sponsor Breedlove, Goodyear reversed its decision. When Breedlove set the LSR, both companies issued press releases describing their products used on the car. Firestone also used records set at the salt flats to promote its products. In 1957, for example, it ran a magazine ad that bragged that “only Firestone” could stand up at 261 mph, a record set by Kenz and Leslie Streamliner on the salt flats that year and the fastest for an American-built car. After describing the engines, the ad explained, “When they came to pick the tires they had no real choice. They had to run on Firestones, because no one else can match Firestone’s years of experience in experimental tire development.” The ad continued to say that if Bonneville Salt Flat racers along with those at the Indianapolis 500 and Daytona Beach used their tires so should the average driver. While many automobile advertisements appeared in car magazines, this Firestone ad appeared in Time and other mainstream American magazines. Sometimes just being on the salt was enough. A Goodyear ad shot at the Salt Flats about speed tests of two custom cars did not mention the tire company, but it showed tires and shirts that said Goodyear. A 1962 article in the Saturday Review called this "The Hidden Sell." American Oil bragged about “our new Amoco, . . . the world’s first radial oval tire.” The advertisement talked about the “six plies between you and the road,” the “2 million miles of road testing,” and “its versatile beauty . . . . red stripe on one side, dual white on the other.” American’s slogan at the time was “you expect more from American, and you get it.” Two tires standing on their own, using the “perfect backdrop” illustrated the ad which appeared in, among other magazines, the Mormon Church’s Improvement Era. The Bonneville Salt Flats became famous because of the racing. But automobiles are not the only companies that use the salt to advertise. Companies and advertisement agencies do not refer to Bonneville’s tradition of speed. Instead, they just want a wide open place. For example, an advertising agency, Size, Inc., shot an album cover for a Japanese band, Mr. Children. The agency’s representative Mayumi Nagata explained that the band saw a photo of the salt flats in a book and wanted to use the same venue. The film crew came from Japan in August 2000, and the crew took a picture of the flats with people. Later they superposed a man and an airplane onto the shot. In addition to a neutral background, some photographers use the salt flats because they want a setting that people recognize as Utah. A Salt Lake City dance company, Ririe Woodbury took its dancers throughout the state for still and TV commercials. Joan Woodbury, one of the principal owners, explained that the dance company had taken pictures at the Great Salt Lake and hoped to go to the red rocks of southern Utah. Bonneville was another Utah example. A local TV station, Channel 4, was already doing a shoot, so the dance company went along. For Woodbury, the nature and the ability to see forever made a beautiful shot no matter what way the model was facing. The dance company used the still photo on the home page of its website and video in a television commercial. The Bonneville Salt Flats are not only the perfect backdrop for ad agencies they also provide a wide open space that motion picture studios and photographers love. Janna Bushman, a BYU geography student, and her professor James Davis examined some of the uses in a 1997 Journal of Cultural Geography article. Using the BLM records between 1990 and 1997, they found ten movies, twenty television programs, and more than thirty commercials that used the salt flats. They also examined motion media in which the producers tried to create an imagined place. They discovered the salt flats represented a “surreal world, a land of destruction and desolation, a playground, and a land of human triumph.” Some fit into more than one category. The TV show Touched by an Angel (which was filmed in Utah) used the salt to show a place between heaven and earth, another world. One of the most famous movies filmed at the salt flats is Independence Day. The movie is about Americans defending the earth from an alien attack. It uses the salt flats to create three locations: El Toro, California, Area 51 in the Nevada desert, and an Iraqi desert. The Bonneville Salt Flats are most easily recognized in the scene in which RVs cross a blank desert. Those who know the salt flats recognize the Floating Mountain and the broad open space. The 2000 movie Slow Burn wanted a desert setting, so it used a cave and the open salt at Bonneville for some scenes. Most of the movie, however, was shot in California where there was some plant life. The opening lines of the movie describe the salt flats the same way that everyone from explorers and pioneers to racers saw the area: "In all the ways that the desert tests you, the most dangerous is the mirage. In those shimmering sparkling depths you see whatever you want – water, wealth, dreams. That is the promise and that is the curse." The British Broadcasting Company used the salt to film a documentary on dinosaurs. BBC explained in a letter to the BLM, "We do not use computers . . . to create our backgrounds and landscapes that the animals will live – they are filmed for real and in order to make the programmes (sic) as scientifically accurate as possible we have been very careful to select locations where the right kind of prehistoric plants and habitats still exist. We believe that Bonneville Salt Flats offer an ideal combination of these elements for our purpose." To create that effect, the BBC planned to bring large plastic models and plant their feet in the salt. After contacting the BLM office, the BBC decided not to use the salt flats. Brigham Young University’s College of Family Life used the salt flats because they wanted a neutral, empty environment that showed that children cannot be left "alone in this world without moral, social and emotional guidance." To emphasis that point, the producer put a baby in a crib all alone on the salt flats. The baby was crying, even though the parents were close by. The shot in the video (about fifteen seconds in a sixteen minute fund raising show) shows the baby in the crib up close with the salt and Floating Mountain in the background. Still photographers find the same benefits as movies. Val Brinkerhoff, a Brigham Young University photography professor, takes class members to the salt flats each year either in the fall or spring. Fall works out well since it is at the beginning of the semester, and he can use the salt flats in teaching lessons on light. Spring provides an opportunity to take photos with reflections in the water. He likes the flats because they are like an empty stage, a neutral area with texture. He finds a peace and a beauty to the desert. Some photographs use the salt flats to illustrate articles on Utah. For example, a New York based photographer, Norman Jean Roy, working for Vogue magazine went to the salt for a shoot. The magazine planned an article on the Elizabeth Smart kidnapping and argued that one of the reasons that this teenage girl was willing to go with Brian Mitchell, a former handyman for the family, and stay with him was because of her Mormon background which included a belief in prophets and polygamy. Rebecca Johnson, the article’s author, spoke with Jeff and Joanne Hanks, a couple living in Salt Lake City who had joined Jim Harmston’s current polygamous church in Manti, Utah. Jeff married Amandah, a seventeen-year-old from a polygamous family, as a plural wife, but she left him because he had had surgery and could not father a child. Eventually, the Hanks decided that they disagreed with Harmston and returned to Salt Lake City, leaving not only polygamy but also The Church of Jesus Christ of Latter-day Saints which they believed had led them along this path. The Hanks were willing to talk about their experience. Others who continued to accept polygamy did not see the connection and refused. At first glance, this story has nothing to with the salt flats, and in fact it should not. But Roy and the setting editor Alexandra Kotur were so taken with the beauty of the salt and its connection with Utah that they drove the family out to salt flats for a picture. The photograph showed the Hanks and their three children hanging on each other and almost pleading to be rescued from the bleak situation. The vastness of the salt flats added to the misery of the photograph. Advertisers started using the Bonneville Salt Flats as soon as the English racers discovered the area as a place to drive fast. But there are no records to confirm all those uses. It is easier to document more recent uses because those who go to the area must get approval from the Bureau of Land Management. Jessie Embry visited the BLM Offices and counted twenty-two advertising companies’ requested use of the salt flats to do video or still photographs of automobiles between 1999 and 2002. In addition, twelve asked to make commercials for other products, three asked to do photo shoots, seven wanted to make a documentary, four wanted to do a movie or television show, and one wanted to run a car on the flat. These numbers are small given the enormous amount of commercials that Americans view every year on television, in magazines, on billboards, etc. But they show that the Bonneville Salt Flats – a place completely avoided by Native Americans – create a desirable image. Even though the LSR has not been set at the salt flats since 1970, automobile companies, advertisement agencies, and owners are still attracted to the place. And others have caught on as well.